Tower Block DVD Review If you’re willing to forgive the film’s shortcomings, you will find a lot to like about Tower Block, especially when you consider what was achieved within the constraints of the small budget. Recommended. Drawing inspiration from films like Assault on Precinct 13 and Phone Booth, Tower Block is a tidy little British thriller that sees the residents of the titular tower block, ironically called ‘Serenity House’, finding themselves getting picked off by a mysterious sniper. The film opens with a young man being pursued by two masked thugs; seeking safety inside the tower block, he finds his impassioned pleas fall on deaf ears as the residents turn a blind eye, complacent from years of living amongst the culture of violence synonymous with lower socio-economic housing. The only exception is Becky (Sheridan Smith), who gets violently assaulted for her efforts and decides not to involve herself further once the police come looking for witnesses to the assault, which led to the young man’s death. Fast forward three months and the residents are being pressured to leave their homes to make way for new development; defiantly staying put until the council intervenes and rehouses them, the main group is comprised of older couple Neville and Violet, Becky, struggling alcoholic Paul, short tempered single mother Amy, junkie duo Gary and Eddie and a middle class family headed by the cantankerous Carol. Rounding out this motley crew is Chav thug Kurtis, who is introduced gleefully collecting payment from each tenant - Protection money to prevent him from destroying their apartments. Many of the residents have little time for one another, other than to exchange barbs, and it’s evident that the impending demolition weighs heavily on most of their minds. Their already tense existence is suddenly exacerbated by the appearance of a sniper – Or a team of snipers, going off of the pinpoint accuracy and rapidity of the shots – Who seems intent on clearing the tower block of all life. As the survivors mange to stumble out into the relative safety of the main hallway (The only area devoid of windows), they find their home sprayed with cryptic graffiti and all exits either blocked off or booby trapped. Forced to work together in order to discover the reasoning behind this seemingly unprovoked attack and hopefully find a method of escape, tempers fray and revelations arise that could upset the delicate equilibrium of the residents’ uneasy alliance. 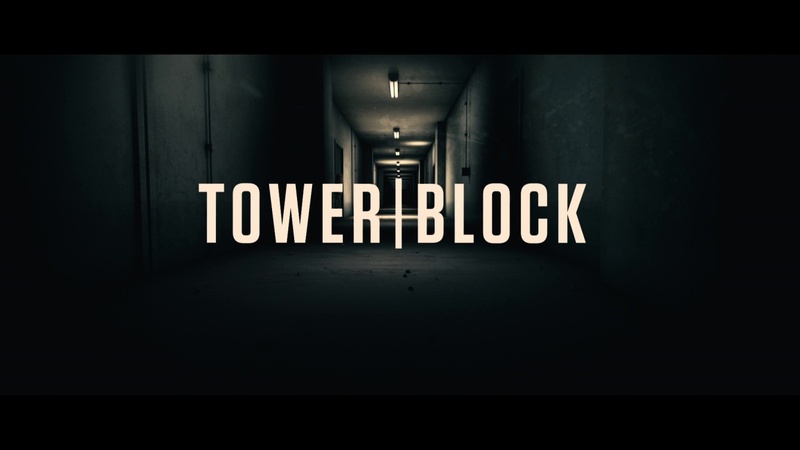 Tower Block is obviously a low budget production, so the setting affords for most of the action to take place on one or two major sets, but the visual style of the film far belies its origins. Competently directed by James Nunn, making his feature directorial debut, the aesthetics of the camerawork and the films setting are utilised to effectively invoke a sense of claustrophobia. The script is tightly written and the premise unique enough to carry the film throughout most of its hour and a half running time, although it has to be said that the ball is dropped quite noticeably in the third act, with the final reveal coming off as contrived and, even worse, clearly obvious after the first half hour. The setting works almost as a character itself, with the oppressive, almost dystopian, colour palette really bringing home the bleakness of existence just above the poverty line. The cast, mostly cribbed from British television, perform admirably and imbue the characters with the realism necessary to elicit true concern for their plight from the viewer. Of particular note is Jack O’Connell as Kurtis; the character’s transition throughout the film could have come off as clichéd in less capable hands, but O’Connell’s portrayal is tinged with that delicately balanced dichotomy of menace and charm that creates an emphatic bond with a character even when they’re, for all intents and purposes, playing the role of the villain. The transfer is of the high quality expected of an Icon release, with suitably inky blacks and no sign of compression or banding. The level of detail is terrific, especially for such a low budget film, and the image remains consistently clear and crisp throughout. Sound is presented with an option for either a 5.1 or 7.1 DTS-HD soundtrack, with both providing brilliant clarity and clear channel differentiation. The sound design is of the utmost quality, with dialogue, incidental ambient sounds and the soundtrack all masterfully balanced. Unfortunately this release possesses no extra features at all. Although it’s not without its flaws, Tower Block is a competent thriller with an intriguing ventral premise and James Nunn and co. Come rather close to pulling the whole shebang off, despite the low budget. The cast perform admirably and the majority of the script offers up unpredictable twist and turns that feel refreshing when compared against bigger budget fare. The plot holes and unsatisfactory ending don’t serve to undermine the tightly wound tension of the rest of the film and I found myself more enamoured by the quality of the film than I initially expected. Tower Block immediately grabs you in the opening minutes and refuses to let go, providing an enjoyable and, at times, genuinely shocking experience. My biggest bone of contention regarding the antagonist could have been easily solved with a throwaway line or reference that would have provided a more solid justification for the preceding events, but, conversely, it could have also sparked derisive cries of clichéd motivation. If you’re willing to forgive the film’s shortcomings, you will find a lot to like about Tower Block, especially when you consider what was achieved within the constraints of the small budget. Recommended.